Oh how I love okra! Tender, sweet with a big piece of crusty bread to sop up the garlicky good sauce and you’ve got yourself a Greek vegan good meal. This recipe gently braises the okra. 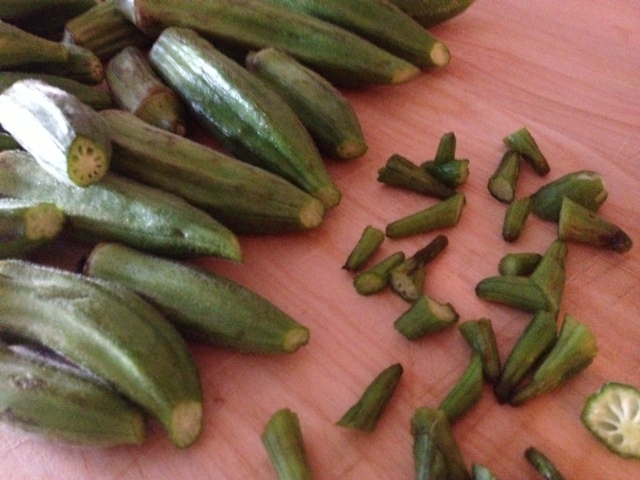 It’s a simple, no fuss method that allows the okra to stew slowly until they’re melt in your mouth perfect. Late spring and early summer is okra season here and I always keep my eye out for them to first appear at my favorite farmers market. They do pop up at the grocery store randomly during the year and I have used frozen okra with ok results but fresh picked is the best when you can find them. I use a 3 qt saucepan with lid for 1-2 lbs of okra. More than that and a larger pot is best. Most important is a well-fitting lid to keep your okra pot/pan tightly covered. This recipe is easily scalable and I’ve made up to 6 lbs at a time with great results. A few simple ingredients are all you need to bring out the delicate flavor of your okra. The light tomato sauce in this recipe perfectly complements the vegetable without overpowering it with batter or breadcrumbs. A couple of quick tips will help make this dish even more delicious. First, soak your okra in a bath of white vinegar, water and salt. This will remove the somewhat silky or slimy texture that okra sometimes has. 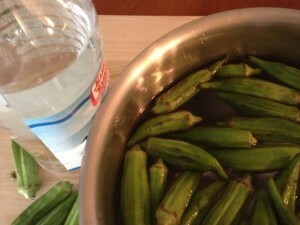 Let the okra soak for 30 minutes to an hour and then rinse and pat dry well. Next, and very important, trim off the very ends of each okra. This will help keep the okra whole through the cooking process. Untrimmed pods can split or explode and, though still very tasty, don’t look all that nice on your plate. 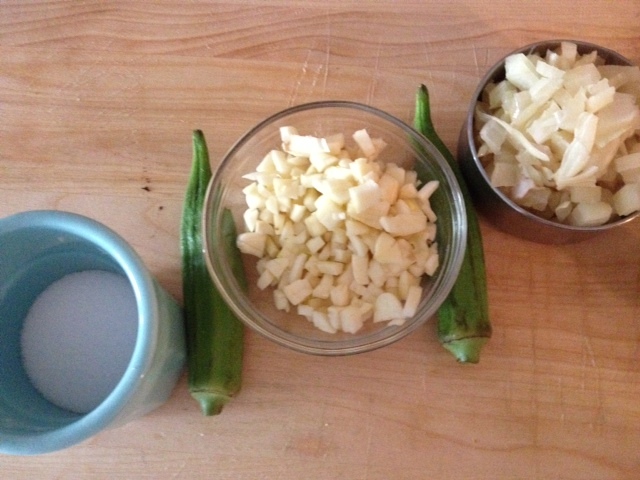 Soak okra in 1/2 cup white vinegar, 1 tsp salt and 1 qt water for 30-60 minutes. Rinse and pat dry.Trim ends from okra and set aside. Sauté onions and garlic in olive oil over low heat in pan/pot with well-fitted lid. Combine tomato paste, water, salt/pepper/sugar and stir well. Add tomato mixture to pan/pot and simmer gently for 5 minutes. Add okra and simmer gently, uncovered, for 5 minutes. Cover tightly and cook on low heat for 45-50 minutes. Serve warm with a piece of crusty bread to sop up all the delicious sauce. I like a squeeze of fresh lemon and sometimes a little chopped fresh dill as tasty garnish. Kali Orexi! Oh they were so gooooood! My first okra in 42 years….glad I found this recipe. Thanks for this recipe. I made some adjustments .. added ginger and carrots and sweet peppers. It is really nice. I did not know okra could be cooked this way! I made this for dinner tonight. It was absolutely wonderful! I added potatoes and had success using frozen okra. 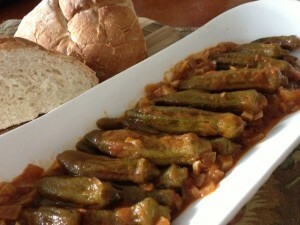 My yiayia would be proud! I have a question: 1/3 cup chopped garlic ? I love garlic but seems a bit much. I think it’s the perfect amount but feel free to scale back if you like! Hmm, my mum would tell me to fry up the okra first to remove the sticky slimy texture one gets before putting them in the sauce. This also sounds like a good trick. 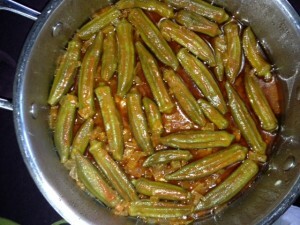 My first attempt at cooking Okra. I used frozen also but did not soak them in the vinegar solution. I also added some beef fillet. It tuned out perfectly well. Very close to my moms.